Beckah Shae, a Nashville-based singer-songwriter popular on Christian radio, snapped selfies with the dedication plaque outside the U.S. Embassy to Israel in Jerusalem. In May, the U.S. renamed a consular building in Jerusalem as its embassy to Israel, a formal recognition of Jerusalem as Israel's capital. 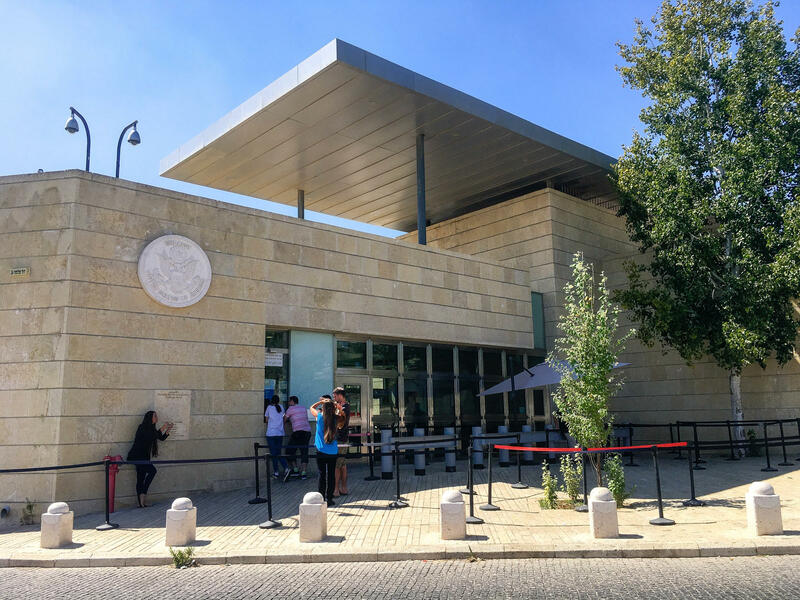 The move was controversial — Palestinians also have claims in the city — but the embassy has become a magnet for American visitors who believe it reflects biblical prophecy. People from the Beit Tehila Congregation ("Teaching the Hebrew roots of the Christian faith") in Brandon, Fla., piled out of a tour bus, posed in front of the embassy wall plaque and sang the Israeli and U.S. national anthems. "This is the center of the Earth right here," said Linda Carter, a member of the church group. "Not the Earth, but the center of our universe — ours." But the new embassy has become a magnet for American visitors, many of them devout Christians who support what it stands for: an about-face in U.S. policy, recognizing Israel's sovereignty claims to the coveted city. "I've seen people praying here. I've seen people crying here," David Friedman, the U.S. ambassador to Israel, told an evangelical Christian television program last week. "We have an embassy open in Jerusalem. That's just something that I kind of thank God every day that we were able to accomplish with the president's direction." On a recent sunny day, a tour bus took two laps around a small traffic circle out front — newly designated "United States Square in honor of President Donald J. Trump" — as tourists with the Chicago-based International Fellowship of Christians and Jews held up their cellphones to the window and snapped photos. 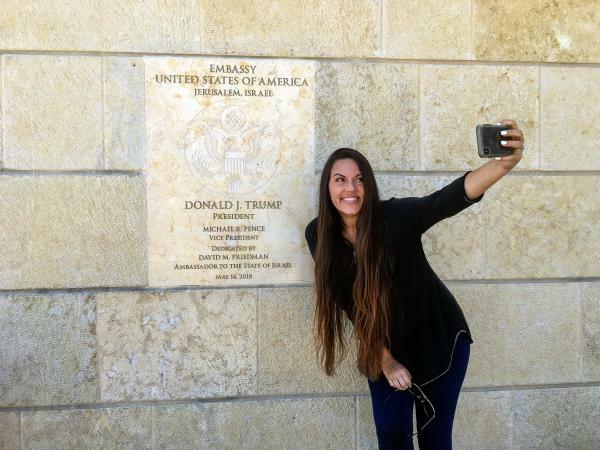 A visitor from Texas, Jason Reyes, wore a Trump-Pence T-shirt and walked an hour from Jerusalem's walled Old City — home to the city's key religious sites — to have his picture taken in front of the embassy. "This is a prophetic moment. This is definitely a prophetic moment," said Reyes of the embassy move, which took place on the70th anniversary of Israel's founding. Most visitors on that day shared a belief in Jesus — though many eschewed traditional labels like "Christian" or "evangelical" — and saw the U.S. Embassy as representing something biblical. A few Jewish tourists were also there, including an Israeli family who liked Trump's gesture — but said Palestinians also deserved a capital in the city. Debra Holm and Diane Weber said they were visiting Israel from Minnesota with For His Name's Sake, a worship group of singers, dancers and musicians, with the aim of reaching out to the Jewish people. They support Trump's embassy move. "I feel like it's the Bible being fulfilled. You look at Scripture. Jerusalem is the capital of Israel. So we're seeing the word of God being fulfilled. So you want to come look at it with your own eyes," said Holm. "It says in Scripture that those that bless Israel will themselves be blessed, those that curse Israel will be cursed," said Weber. "The economy is healthy in the U.S. It isn't that you bless Israel so you get something back, but it's a principle that is true: We are blessing Israel, we are being blessed." Several visitors mentioned the Israeli-Palestinian peace plan President Trump says he'll present in a few months. Last month, Trump said he thinks the two-state solution would work best — a Palestinian state alongside Israel, which would likely require Israel to give up West Bank land it currently occupies. Many visiting the embassy had a blunt message for the president: "Don't give up any land. Do not negotiate to give up any land," said Weber. She believes Palestinians won't stop at a Palestinian state and will want Israel for themselves, too. "It doesn't mean that you discriminate against the Palestinians," said Brunner, the visitor from Georgia. "You know, you love them and they should be taken care of and things like that. But Israel is sovereign, and they should have their own sovereignty. This is their land." As the Beit Tehila church group from Florida sang, a Palestinian-American watched. "Everybody can say, 'My God told me this is my land.' God's plan for me is this is Palestine," said Zakaria Hajeer, who was at the embassy for a relative's visa interview. Other Palestinians visiting the embassy were not interested in talking politics. They were trying to get visas to emigrate to the U.S.
"There's more freedom in the U.S.," explained Jacqueline Rafiq, who was there with her husband and six children. They had traveled from their home in the Israeli-occupied West Bank. "In the West Bank, we can't take our kids out for fun. You need Israeli permits for everything. And I want to keep my children protected." Her family happens to be Christian. But they don't see the U.S. Embassy in the same way many of the American Christian photo-taking visitors do. For Rafiq and other Palestinians, the embassy offers a path to escape from a tough life.